My last wedding before Christmas took me back to Clonabreany House​ exactly a year to the day after my last visit there. Clonabreany is a fab venue, especially if you get the weather for outside photos, and while, by the time we got there for Maeve and Paul’s wedding, we were squeezing the last out of the available daylight due to the overcast day, we did get to avail of its beautiful grounds for the briefest of portrait sessions. Being honest, though, even if we had been confined indoors at that point, I wouldn’t have been too bothered because I’d already been gifted some beautiful photos and beautiful light right from the get go, thanks to Maeve and Paul’s choice of getting ready venue – the stunning Bellinter House​. This was a wedding that oozed style – not just the bride and groom, but pretty much everyone to be honest… the father of the bride was definitely one of the most stylish I’ve ever photographed, but wherever you looked this was a fashionable affair. It was an absolute pleasure to work alongside Martin Healy Videography​ who was taking care of the moving images on the day, and who did a fantastic job. The team at Clonabreany took great care of us also as they always do. 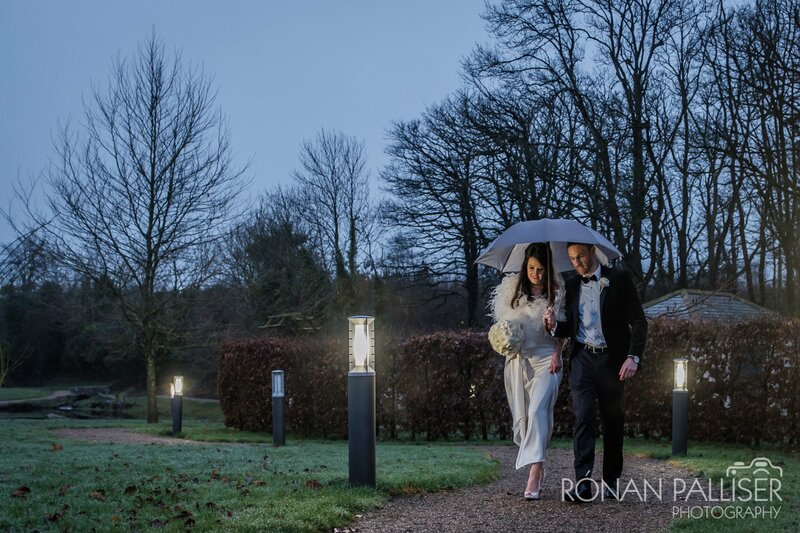 Thanks most of all, though, to Maeve and Paul for sticking with the outdoor photos as the mist slowly turned to rain, and for braving the cold after dinner for a photo in the beautiful gardens before the Bentley Boys got the dancing started. If I had any thoughts of asking Santa for a great wedding to photograph as a Christmas present, my Christmas came three days early with this one.